Beautiful centered design detailed with round collars and a solid panel at the bottom. ..
We designed this door to be fully symmetrical, bending square bar into mirror imaged scrolls and accented them with square collars. Compliments all architectural styles. .. 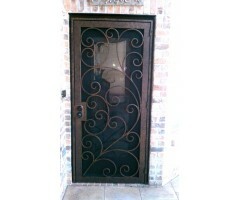 This artistic door is all dressed up in style, with 4 centered rosettes, intricate scroll arrangement, and a solid bottom embellished panel. .. 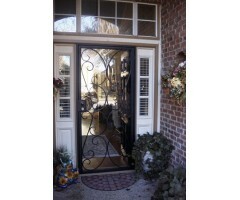 The glamorous sweeping scrolls on this screen door is very captivating, creating a welcoming entrance to your home. .. 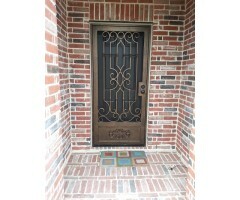 Formal details on this door include mirrored top and bottom scrolls, with 3 rows of evenly spaced square collars providing detail with dimension to the door. .. 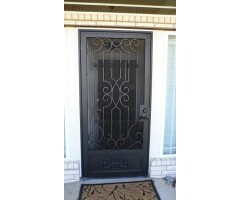 Similar to SD-005 except this screen door offers 4 additional feature components, with alternate spacing on the square collars. Equally as beautiful, and just as complimentary to all architectural styles. .. Continuous large sweeping scrolls create a vision of elegance and welcome. .. 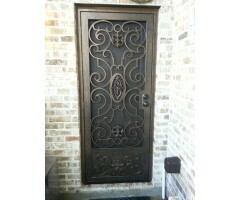 The sectional detail framing on this long sweeping scroll is striking, and made a stunning impact on this door. ..
Tri-sectional detailed framing on this elongated seven strand scroll is exquisite, and would add visual delight to any home! .. 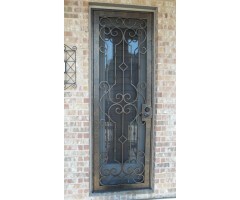 This screen door was specifically built with beautiful large open elements. It offers the homeowner security while enjoying an optimal field of vision and fresh outdoor air. .. This double screen door was fabricated with continual flowing mirror imaged cluster scrolls, creating an impressive statement to the home. .. The components of this screen door blend beautifully to create a secure, functional, architectural work of art for this home. ..